Under notice from the Ludhiana Municipal Corporation for the misuse of its parking space provided in the basement for the past several years, the Ludhiana Stock Exchange (LSE) is now out to make amends. A Punjab Police assistant sub-inspector (ASI) and a constable have been booked for extortion. A woman and her two-year-old daughter were run over by a train. Her four-year-old daughter is battling for life at the Civil Hospital. The two-year-old breathed her last at the Civil Hospital. The victim, who appeared to be a migrant, could not be identified. Jaswant Singh, in charge, Dhandari GRP post, said: "The incident took place around 5 pm. The area is heavily populated. It is not clear whether the woman had attempted suicide or she was crossing the railway tracks." Shiv Ram Saroay, member of the Rogi Kalyan Simiti, said the NGO would foot the medical bills of the injured child. Phulkari, the traditional art of Punjab is losing its sheen. Though it is making a mark in the fashion world after ace designer Manish Malhotra launched a collection based on phulkari, it has failed to find takers in the state. As the authorities have to meet the deadline of linking the Aadhaar card numbers with bank accounts of consumers and then with the main portal in Delhi, officials are working overtime to make Aadhaar cards of residents by November 30. Awareness about donating one's body for medical research has been slowly picking up over the past few years. Breaking the social taboo, more and more people are coming forward for the noble cause. Nationalised banks' instructions have jolted teachers. Lamenting that a 'step-motherly' treatment was being meted out to them, the teachers said they would now get loan up to six salaries (if the monthly salary of a teacher is Rs 30,000, he can get loan up to Rs 1.80 lakh). After four members of the United Cycle and Parts Manufacturers Association withdrew their nominations, 19 candidates will now contest the elections scheduled for September 14. The four members are Manjit Singh, Sukhdev Singh Bhinder, Pardeep Wadhawan and Manmohan Singh Ubhi. The Communist Party of India (CPI) today launched a mass contact programme to mobilise people with a call to defeat the communal designs of the Bhartiya Janata Party (BJP) and to oust the anti-people UPA-II in the coming Lok Sabha elections. Resenting the implementation of the e-trip system, traders observed a one-day hunger strike and staged a dharna at Madhopuri Chowk today.Hosiery, yarn and oil manufacturers today observed a black day. While the administration is yet to start the preparations for the upcoming rural fair, Chappar Mela, organisers have already set up their stalls in the area and devotees have already started pouring in, a week ahead of the formal commencement of the mega event. Saka Saragarhi Divas was observed with religious fervour at Guru Gobind Singh Public School, Pakhowal Road, by Punjabi Virsa Foundation. Cardiovascular and thoracic surgeons held a meeting on Monday. Dr Harinder Singh Bedi, head, cardiovascular endovascular and thoracic surgery, Christian Medical College & Hospital, said 55 surgeons from Punjab, Haryana, Himachal Pradesh and J&K attended the meeting. A warm send-off was given to the outgoing Deputy Commissioner, Rahul Tiwari, today. Officials of the district administration held an event at Bachat Bhawan where the DC was given a memento. Tiwari asked officials, staff to work diligently. There seems to be no stopping to vehicle-lifting incidents. In the latest case, the vehicle thieves fled away with a car parked outside the Rose Garden here today. 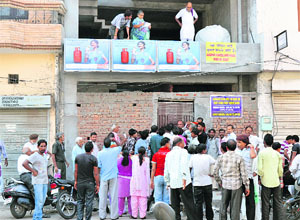 The Jagraon police has tightened noose around the drug peddlers active in the area. A school teacher was allegedly accused of molesting some students at Government Senior Secondary School near Jagraon. Following the allegations, parents of several students and a large number of villagers reached on the premises of the school and created a ruckus. Two drug peddlers have been arrested by the Jagraon police near Munabarpura village in Sidhwan Bet area during a routine patrolling yesterday evening. 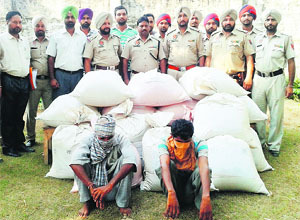 The police has seized 15 bags of poppy husk from the accused identified as Gurnam, a resident of Tihara village, and Harnek Singh, a resident of Sherewal. The police has also impounded the truck in which the drug was being smuggled. The police nabbed one person for carrying psychotropic powder here yesterday. The accused has been identified as Piyara Singh, a resident of Raikot. The Sadar police has arrested two persons allegedly involved in supplying habit-forming drugs among students and farm labourers. 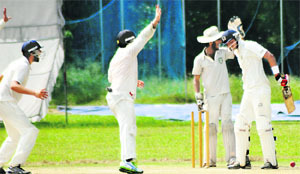 Powered by superb batting by Geetansh Khera who scored 110 runs, Ludhiana overhauled Mohali's first innings total of 202 runs to take a vital lead of 46 runs on the second day of the match in the ongoing Punjab State Inter District Cricket Tournament for the Katoch Shield being played at Punjab Agricultural University ground here today. The following players (men and women) have been selected to represent Punjab state in the Sixth North Zone Softball Championship scheduled to be held from September 15 to 17 at Parwanoo in Himachal Pradesh, Pran Nath Passi, honorary secretary, Punjab Softball Association, said.